All photos courtesy of Studio Agnes. Guatemala City-based Agnes Studio has created a revisionist history of Central America, developing a design collection that reflects what might have transpired without the interference of European colonization. Their latest collection, ‘Living-Stone’ offers an alternative outcome to their region’s history, envisioning design in a post-human utopia. The Altar Console is made with volcanic rock and black marble. 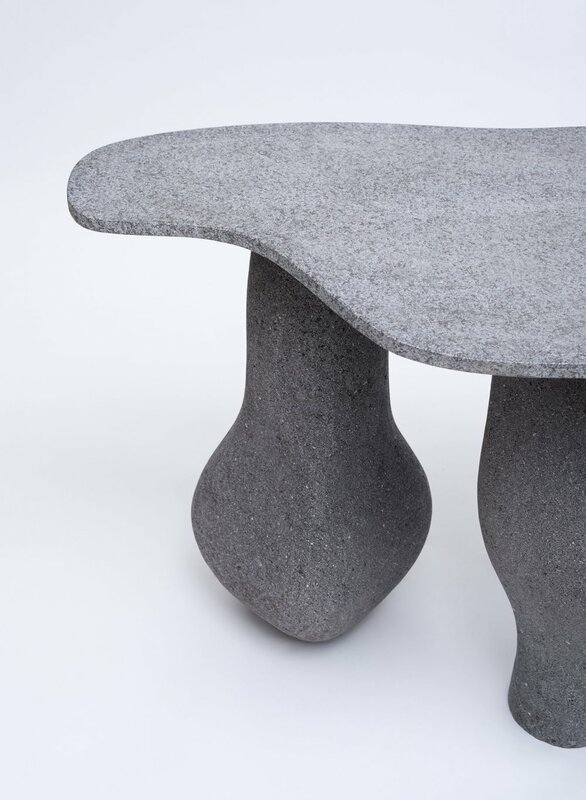 The mammoth, elephant-like legs are hand-made by local artisans with volcanic rock from Lake Atitlán, while the black marble is shaped by a local marble quarry and workshop. Made with organic hand-woven Momostenango wool and Concaste wood. Momostenango wool is a special wool sourced from the Guatemalan highlands, typically used for rugs and tapestries. In this instance, the studio aimed to create a chair that would elevate the material as the principal element of the design. Made with volcanic rock, hand-cast aluminum, powder-coated steel and brass hardware, the lamp explores the literal and symbolic representation of a mountain. An homage to the solar eclipse, this set of screens plays with the duality of solid and empty space, combining circular shapes halved by a hand woven wicker weave. Made with hand-woven wicker, mirror, and pine. Made with hand-woven wicker, mirror, and pine. Tlacuache is named in honor of the Tlacuache or Tacuacin, the only Mesoamerican marsupial, important in pre-Columbian mayan mythologies as Hunapuh-Vuch, the God/ Goddess of Dawn. Made in hand-carved volcanic rock. Studio Agnes’ Apolonia rug series in Momostenango wool were designed to be used as useful floor rugs as well as decorative wall art. The geometric patterns were inspired by the Guatemalan highlands at different hours of the day. “El Día” or The Day.